Origin and Habitat: South-eastern Arizona from Maricopa and Pima to Greenlee and Cochise counties, east to southern New Mexico from Hidalgo County to southwestern Lincoln County, and in El Paso County, Texas. It is also found in Mexico to Sinaloa and Chihuahua. Habitat: It grows primarily in desert shrub and grasslands in the Sonoran and Chihuahuan deserts, but also in shrub-steppe, Chaparral, mountain shrub, pinyon-juniper open forest and deserts often on gritty, rocky or sandy soils on the hill-sides from 300 to 1,600 m elevation. It gets lots of water in two months and lots of sun all year. They are not associated with washes and arroyos but rather grow along rocky ridges and open bajadas. 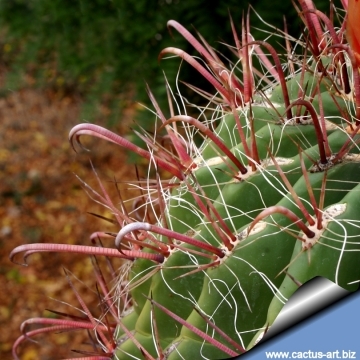 The "fishhook" spines and the armored web of spines enclosing the cactus body are a defense against herbivory. 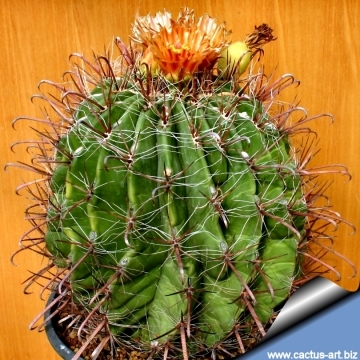 It prefers full sun, and does well in hot arid climates. It is, however, frost-tolerant to -15 degree Celsius. The flowers are pollinated by cactus bees (Lithurge spp.). Mule deer, birds, and javelina eat the fruit. The birds especially like the seeds. The people of the Sonoran Desert use the fruit for candy and jelly. The skin thickens with age, making older cacti more fire resistant. Even so, average mortality due to fire is 50 to 67 percent within the first two years following fire. Some species generally associated with barrel cactus include prickly Opuntia spp., Acacia spp., ocotillo (Fouqueria splendens), Yucca spp. and saguaro (Carnegiea gigantea). 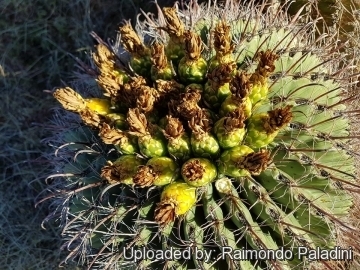 Ferocactus wislizeni var. tiburonensis G.E.Linds. 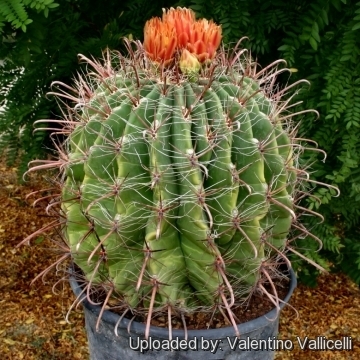 Description: The fishhook barrel cactus (Ferocactus wislizeni) is a barrel shaped or columar cactus that stay usually a single column; rare specimens may be multiple, typically it grows to a diameter of roughly 50-80 cm. A height of 1-2 metres. However, specimens as tall as 3 metres have been recorded. Life span has been reported to be from 50 to 130 years. In habitat often this barrel-shaped cactus leans to face southward toward the equator, earning them the nickname "compass barrel cactus". Older barrels can lean so far they uproot themselves and fall over, especially after heavy rains when the soil is loose. 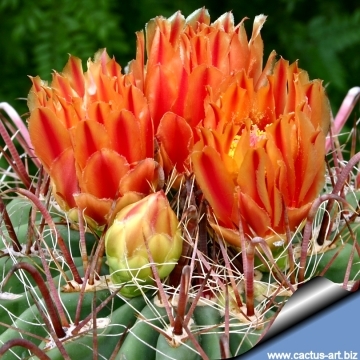 Its flowers are yellow to red-orange and appear atop the cactus fruit during the summer months. The common name comes from the spines, which are thick and hooked. Stem: Simple or occasionally sparsely branched from base, globular to cylindrical, 45-80 cm in diameter, up to 2 tall, rare specimens to 3 (or more) m high, epidermis leathery asparagus green. Ribs: 20-28(-30) sharp ribs, occasionally spiralled, not strongly tuberculate, about 3 cm tall. The ribs appears like accordion pleats on the body of the plant. 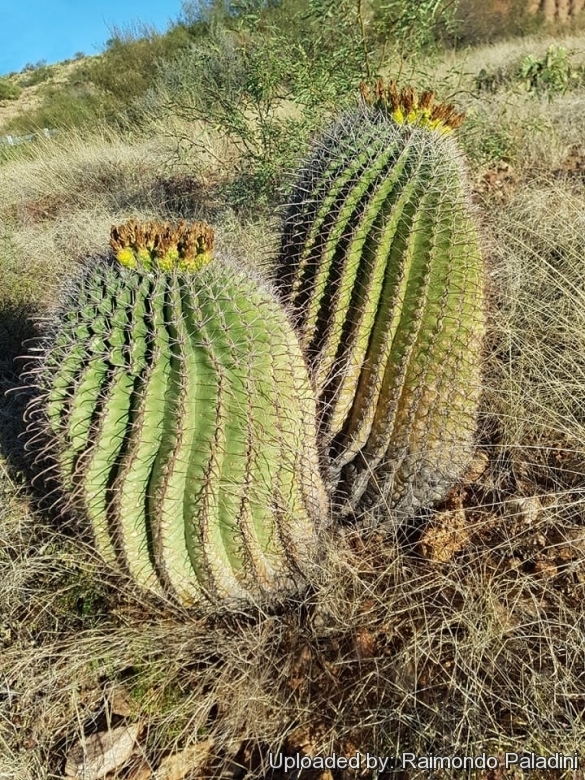 With abundant moisture the pleats are less pronounced, but they become deeper as the cactus uses its reserves of water during drought. Areoles: Large, oval to elliptic, brown-tomentose in youth, spaced 2-3 cm apart in flowering portion, later nearly close to each other. Central spines: 4 cruciform, (occasionally more), ashy grey to white or reddish, upper three usually similar, terete, straight, about 3.8-5 cm long, the lower strongest, larger 3.8-5.0 cm long, at least one (the lower) flattened laterally, larger, curved inward and hooked, often hooked at tip, often 8-10 cm long, 5 mm. Wide. Radial spines: 12 to 20 variable, from bristle-like to acicular, up to 4.5-5 cm in length. 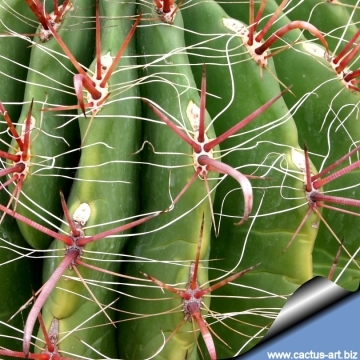 Roots: The root system of barrel cactus is shallow and confined to the upper soil layers. Usually a main anchoring root extended down to about 20 cm and had several short laterals. Horizontal roots originated from the root crown are very shallow. Depth of burial decreased with distance from the plant and ranged from 1.5 to 3.0 cm. Flowers: Its flowers colour is varies from yellow to (usuallly) firey orange-yellow with reddish midribs and brown tips or nearly red. About 4-7 cm long and broad. Inner perianth segments ovate to lanceolate, about 20 mm long, 5-10 mm wide, red with yellow margins or sometimes pure yellow. Flowers form on growth of the current season in circle around top of plant (around meristem). Blooming season: Sporadically in late spring and profusely in summer and early autumn. 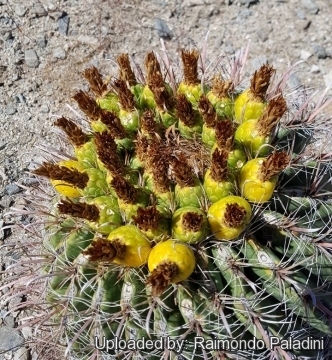 Fruits: Fleshy at maturity, pineapple-shaped, green when unripe, yellow after the flower dries up, up to 5 cm long, and persist atop the cactus long after the flower is gone, sometimes for more than a year. They are favorite food of wildlife. 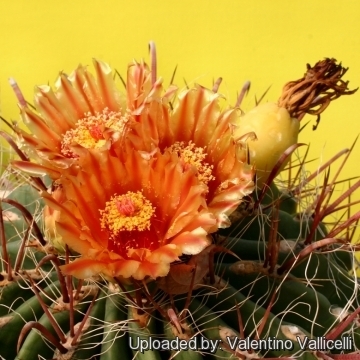 Ferocactus wislizeni Britton & Rose: (subsp. wislizeni) Central spines 4, forming a cross, the lowermost stoutest, and often hooked, 8-10 cm long. Radial spines about 12 needle- to bristle-like, to 5 cm. Flowers yellow to yellowish orange to red, Distribution: central and southern Arizona, southern New Mexico, southwestern Texas, and northwestern Mexico in Chihuahua, Sonora, and Sinaloa. Ferocactus wislizeni subs. ajoensis Fencl & Kalas: has slender columnar stem, longer, denser and more robust spines and earlier and longer flowering period during the summer months. Distribution: Arizona (Pima, Pinal, Maricopa and Yuma counties). Ferocactus wislizeni subs. herrerae (J.G.Ortega) Pilbeam & Bowdery: Central spines 6, grey, ribbed, angled or hooked at the tip, to 10 cm (3.9 in) long and 5 mm wide. Radial spines several, white, twisted, radiating. Flowers yellow with red midveins. Distribution: Sinaloa, Sonora, and Durango, Mexico. Ferocactus wislizeni subs. tiburonensis (G.E.Linds.) Pilbeam & Bowdery: Central spines 4, forming a cross, round in cross section, lower one sometimes flattened, to 9 cm long. Radial spines awl shaped, similar to the centrals, not bristle-like. Flowers yellow. Distribution: Tiburon Island, Gulf of California, Mexico. 6) Wikipedia contributors. "Ferocactus wislizeni." Wikipedia, The Free Encyclopedia. Wikipedia, The Free Encyclopedia, 21 Jun. 2017. Web. 31 Oct. 2017.